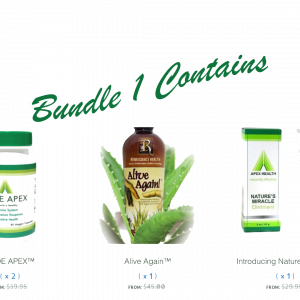 Nature’s Miracle is a premier organic Aloe Vera-based oxidative skin therapy ointment, that helps to re-establish cellular regeneration and skin health. 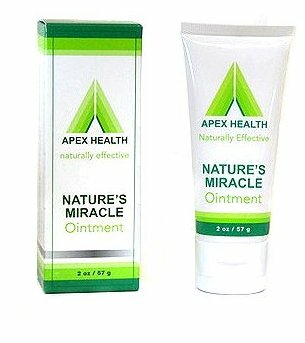 Inspired by research done at Utrecht University, in the Netherlands, Nature’s Miracle was developed with some of the same ingredients contained in the original cream used in the Utrecht University studies, however, improved by Apex Health’s unique formulation in a base of organic Aloe Vera, the powerful ingredients in Nature’s Miracle boosts the body’s healing fibroblasts by as much as 121%. (Dr. Robert Davis University of Pennsylvania). 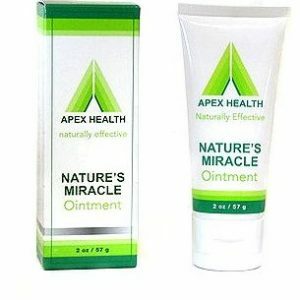 A naturally effective ointment, Nature’s Miracle recommended use is for: burns, sunburn, abrasions, cuts, insect bites, rashes, bed sores, diabetic ulcers, and other topical applications. Non-greasy and pleasant smelling, Nature’s Miracle 2 oz tube makes a smart addition to any medicine cabinet. *Organic Aloe Vera Barbadensis Leaf Juice, Stearic Acid, Isopropyl Palmitate, Quercus, Rubra, (Red Oak) Bark Extract, Simmondsia, Chinensis (Jojoba) Seed Oil, Cetyl Alcohol, Glycerin, Sorbitol, Tocopheryl Acetate, Ascorbic Acid, Melaleuca, Alternifolia (Tea Tree) Leaf Oil, Water, Phenoxyethanol, Ethylhexylglycerin, Trethanolamine.